While starting his career adhering to Brahms’ “absolute” or “formalist” compositional approach, Richard Strauss rapidly turned into a staunch supporter of Wagner’s Zukunftsmusik, writing a series of iconoclast symphonic poems full of metaphysical allusions. This album features both sides of Strauss’s musical persona with the Burleske in D minor as well as Ein Heldenleben. While the former is a playful, miniature quasi concerto for piano and orchestra, the latter epitomises Strauss’s symphonic style: majestic, virtuosically orchestrated, full of grand ideas, but never without irony. In that respect, Ein Heldenleben has more in common with Burleske than one would expect. Strauss’ arguably satirical self-identification with the hero of his symphonic poem is underlined by recurrent self-quotations from previous compositions. The central role of the solo violin makes it another solo concerto in disguise, albeit less overtly than Burleske. 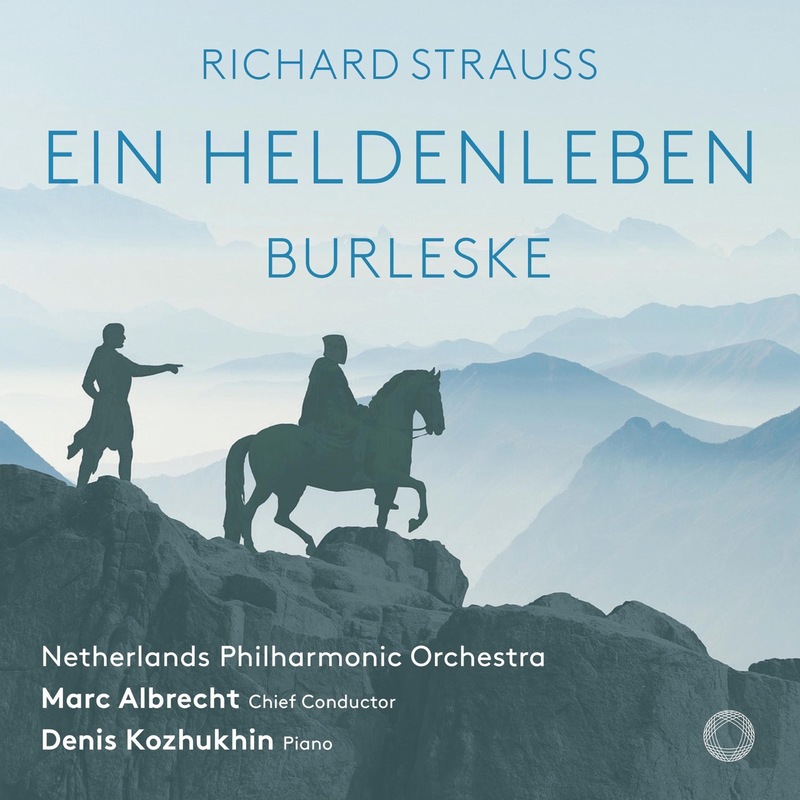 These two remarkable pieces are performed by the Netherlands Philharmonic Orchestra and their chief conductor Marc Albrecht, with Denis Kozhukhin delivering the solo piano part in Burleske. All have an impressive track record at PENTATONE. Albrecht and the Netherlands Philharmonic Orchestra have released acclaimed albums such as Mahler Song Cycles with Alice Coote (2017) and Mahler’s Symphony No. 4 with Elizabeth Watts (2015). Kozhukhin has recorded piano concertos by Ravel and Gershwin (2018) as well as Tchaikovsky and Grieg (2016), and has been extensively praised for his Brahms Ballads & Fantasies solo album (2017). The Netherlands Philharmonic Orchestra and its partner the Netherlands Chamber Orchestra together constitute the non-profit foundation Stichting Nederlands Philharmonisch Orkest. The two orchestras are the principal orchestras for the Dutch National Opera in its opera house Dutch National Opera & Ballet, Amsterdam. The orchestras regularly perform classical concerts in the Concertgebouw Amsterdam alongside their operatic commitments; they are welcome guests in other Dutch cities and also make frequent appearances in concert halls and festivals outside of The Netherlands. The NedPhO|NKO brings classical music to life at the highest level and collaborates closely with international musicians and conductors. Both orchestras take great pleasure in developing and welcoming new musical talent. At the beginning of the 2011/2012 season, Marc Albrecht was appointed chief conductor of the Netherlands Philharmonic Orchestra; the artistic director and concertmaster of the Netherlands Chamber Orchestra is master violinist Gordan Nikolić. Two of NedPhO|NKO’s most important trademarks are their inviting programming and their accessible concert presentation. Everyone feels welcome at a NedPhO|NKO concert, experienced concert-goers and first-timers alike. The musicians guarantee extraordinary concert experiences thanks to the enthusiasm with which they share their passion for music and their exceptional skill with the audience. Their concerts also form the basis for music related events, including opportunities for the audience to meet soloists and orchestral players. The NedPhO|NKO is well-known for its active involvement in cultural and social matters. Its large-scale educational programme NedPhO GO! brings classical music within everyone’s reach: the performances given in unusual venues in the suburbs are combined with appealing educational activities for children and youngsters and people who would otherwise perhaps not visit a concert hall. The musicians of the NedPhO|NKO acknowledge their responsibility towards the future of classical music by passing on their passion for music to a new generation, making sure their concerts kindle an enthusiasm for classical music amongst the young and the old. Marc Albrecht A dynamic and accomplished presence both on the orchestra podium and in the opera pit, and a regular guest at Europe’s most prestigious opera houses and orchestras, Marc Albrecht is particularly acclaimed for his interpretations of Wagner and Strauss, as well as for his commitment to contemporary music. He holds the position of Chief Conductor of both the Netherlands Opera and the Netherlands Philharmonic Orchestra/Netherlands Chamber Orchestra, and in 2013 both contracts were extended until 2018. In the early years of his conducting career, Albrecht spent several seasons at the opera houses of Hamburg and Dresden, and also was appointed personal assistant to Claudio Abbado at the Gustav Mahler Youth Orchestra in Vienna. In 1995 he embarked on a highly successful 6 year tenure as Music Director of the Staatstheater Darmstadt, and from 2006-2011, he was Artistic Director and Chief Conductor of the Orchestre Philharmonique de Strasbourg. In the opera house, Marc Albrecht’s highly acclaimed work during the past seasons has included a new production of Der fliegende Holländer at the Bayreuth Festival (2003–2006), Die Bacchantinnen by Wellesz at the Salzburg Festival (2003) as well as Janacek’s From the House of the Dead at the Opera National de Paris (2005). 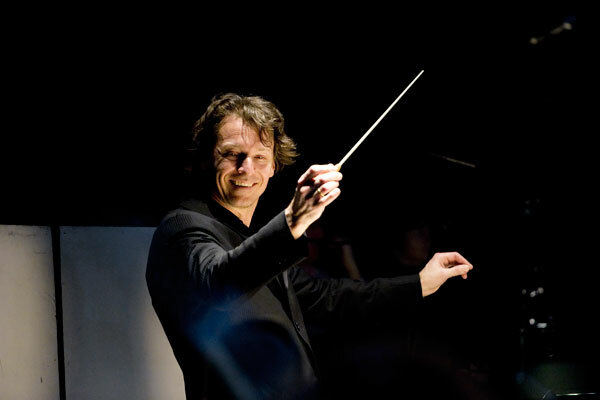 From 2001-2004 he was Principal Guest Conductor at the Deutsche Oper Berlin, leading successful productions such as Messiaen’s Saint Francois d’Assise, and he also maintains a close relationship with the Semperoper Dresden, where amongst others he has conducted La Damnation de Faust, Die Frau ohne Schatten and Elektra. Recent highlights include Tannhaüser and Die Soldaten at Zurich Opera, Henze’s Die Bassariden at the Bavarian State Opera, his debut at the Royal Opera House Covent Garden with Der fliegende Holländer, Henze’s Der Prinz von Homburg at Vienna’s Theater an der Wien, Lulu at the Geneva Opera and at the Salzburg Festival (with the Vienna Philharmonic), and a notable success standing in at short notice in 2012 to make his debut at Teatro alla Scala with Die Frau ohne Schatten. At the Netherlands Opera he has conducted productions of Die Frau ohne Schatten, Fidelio, Carmen, and since his appointment as Music Director, Elektra, The Legend of the Invisible City of Kitezh, Der Schatzgräber, Die Zauberflöte, Die Meistersinger von Nurnberg, the world premiere of Manfred Trojahn’s Orest, Prokofiev’s The Gambler, and Strauss’ Arabella, and in their 2014/15 season he conducted new productions of Gurrelieder, Lohengrin and Verdi’s Macbeth.The 15/16 sees him leading productions of Der Rosenkavalier, Hansel und Gretel and Don Giovanni. 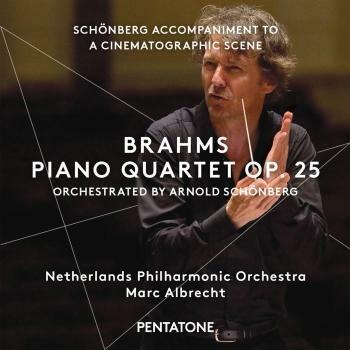 Marc Albrecht has made a sequence of acclaimed recordings for PentaTone records with the Orchestre Philharmonique de Strasbourg, including discs of Strauss tone poems, the piano concertos of Dvorak and Schumann with Martin Helmchen, Korngold’s Symphony in F sharp and the orchestral music of Berg, Dukas, Koechlin and Ravel. He has continued his association with PentaTone with the Netherlands Philharmonic, and their recordings of Mahler’s Das Lied von der Erde and Symphony No. 4 have been released to strong critical reviews. 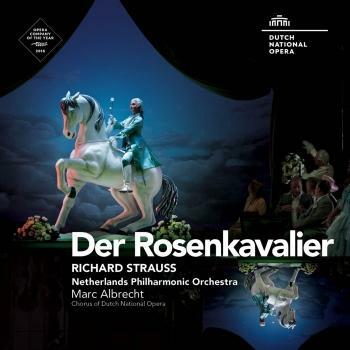 The Netherlands Opera has also released live CD recordings of his performances of Elektra, Orest and Der Schatzgräber on the Challenge Classics label, and DVD of The Legend of the Invisible City of Kitezh on Opus Arte.